While testing unattended Windows deployment I encountered another problem. Windows could not parse or process unattend answer file [C:\Windows\Panther\unattend.xml] for pass [specialize]. The answer file is invalid. When closing the dialogbox the computer restarted. The computer restarted unexpectedly or encountered an unexpected error. Windows instalation cannot proceed. To install Windows, click "OK" to restart the computer, and then restart the installation. Started troubleshooting by booting into Windows PE. IBS    UnattendErrorFromResults: Error text = Windows could not parse or process unattend answer file [C:\Windows\Panther\unattend.xml] for pass [specialize]. The answer file is invalid. This didn’t reveal the exact cause of the error, but it inspired me to examine unattend.xml. I transferred unattend.xml to my work computer and then tried opening the unattend.xml file with Windows System Image Manager. Validation error on D:\ToBeDeleted\Fail_Info\Panther\unattend.xml, line 18, column 32. Details: The 'wasPassProcessed' attribute is not declared. The 'ComputerName' element is invalid - The value 'DeployTestPhysical' is invalid according to its datatype 'ComputerNameType' - The actual length is greater than the MaxLength value. The unattend.xml file was modified by a custom program just before deployment on the target computer. This custom program did not prevent computer names longer than 15 characters. The problem was fixed by updating the custom program. Special care should be taken when modifying unattend.xml by scripts or programs. An invalid unattend.xml file may cause problems during Windows setup, which are not immediately obvious. While testing unattended Windows deployment I encountered a problem. Windows could not complete the installation. To install Windows on this computer, restart the installation. Then the machine would countinually reboot and show the last message. However these files contained no useful clues. My initial understanding of the user password format in AutoUnattend.xml turned out to be wrong. This problem was not discovered by Windows System Image Manager, because AutoUnattend.xml was updated just before deployment by a custom program on the target computer. 1. Text is initially encoded as unicode / UTF-16. 2. Then a “Password” string is appended to the password. 3. Finally the password string is base64 encoded. Windows PE is limited to running one type of executable (either x86, AMD64 or ARM), depending on the type of Windows PE image. This also affects .NET applications. The subsystem needed to support the image type is not present. This can happen if the “Prefer 32-bit” build option is set, which is the default for some project types with Visual Studio 2015. The solution is either to remove the “Prefer 32-bit” option before compiling. Windows could not apply unattend settings during pass [offlineServicing]. 2016-10-20 15:20:20, Error      [0x0606ae] IBS    [SetupCl library] Required profile hive does not exist: [\??\D:\WINDOWS\system32\config\systemprofile\NTUSER.DAT]. setupact.log contained no additional useful information. 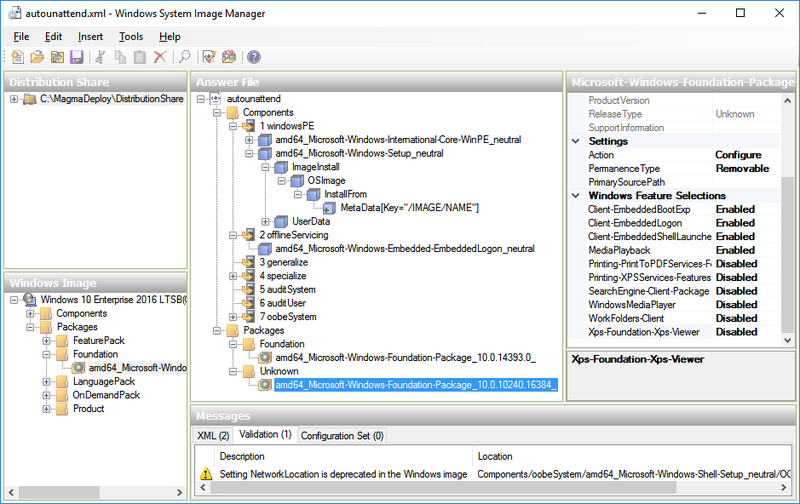 I wondered why the Microsoft-Windows-Foundation-Package could not be opened, so I went back to Windows System Image Manager. There I noticed that the package was unknown, because the version numbers had changed. After verifying that all settings had been copied, I deleted the unknown package. 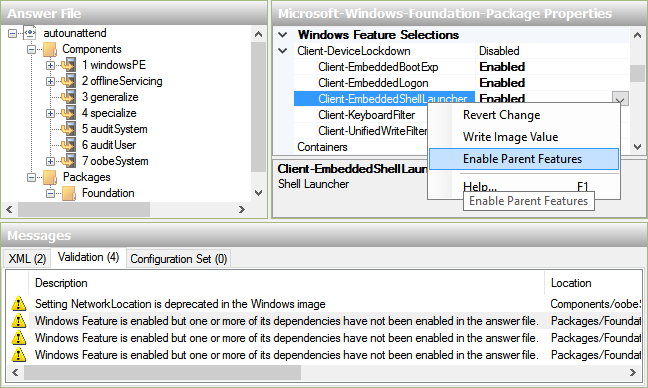 Windows Feature is enabled but one or more of its dependencies have not been enabled in the answer file. After making these changes new configuration sets / deployment images could be installed successfully. When reusing AutoUnattend.xml with a new Windows image, please look for unknown packages in Windows SIM in addition to validating the answer file. If any unknown packages are found, please update the version numbers in AutoUnattend.xml. I recently encountered problems when deploying Windows (using AutoUnattend.xml) on a test machine. The situation occured because the computer booted in BIOS mode, while the DiskConfiguration specified in AutoUnattend.xml was for UEFI. When actively choosing UEFI in the boot menu, it worked as expected. UEFI, not BIOS: Remove bootmgr file from media root. BIOS, not UEFI: Remove efi folder from media root.